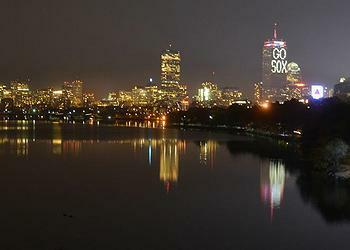 BOSTON, Massachusetts, October 30, 2013 (ENS) – Boston’s 101-year-old Fenway Park – where the World Series was won by the Boston Red Sox tonight for the first time since 1918 – is at increased risk of flooding due to climate change, warns the National Wildlife Federation. Calling the baseball diamond “a diamond in the marsh,” the environmental group points out that low-lying Fenway Park took its name from The Fens, the saltwater marshland around the Muddy River on which it was built. Parts of the neighborhood, like much of downtown Boston, were built on filled-in marshy areas, blogs the NWF’s Miles Grant. As recently as 2010, heavy rains flooded the dugouts and batting cages at Fenway. The water doesn’t drain well because the playing field is at street level. The subway station most Fenway fans use, Kenmore Square, suffers major flooding when the Muddy River has overflowed its banks. The Environmental League of Massachusetts Action Fund, the political wing of the National Wildlife Federation’s state affiliate, is calling attention to what it calls “the dire situation” at Fenway right now in view of superstorm Sandy’s first anniversary this week. Sandy’s center came ashore in New Jersey on October 29, 2012, hundreds of miles to the south of Boston, as a Category 2 storm, but it became the Atlantic hurricane with the largest diameter on record, with winds spanning 1,100 miles. The latest poll in the Boston mayoral race from UMass Amherst shows State Representative Marty Walsh, a Democrat, opening up a seven-point lead on his opponent City Councilor at Large John Connolly, a Republican, with less than a week to go before the election. 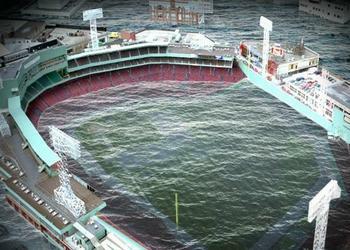 The Environmental League of Massachusetts released this artist’s concept of a flooded Fenway Park. Fenway Park itself and the Red Sox ball club are doing what they can to fend off climate change. In 2008, the Red Sox became the first team in Major League Baseball to install solar thermal panels at a ballpark. The panels help heat water throughout the facility, saving an estimated 18 tons of carbon dioxide emissions each year. The Red Sox management says that’s the environmental equivalent of planting 4.86 acres of trees, or not driving a car for 43,611 miles. The energy-efficient LED lighting systems for some large billboards at Fenway Park use one-tenth the power of equivalent, traditional lighting displays. As part of Fenway’s 2010 Improvement Projects, we have installed motor driven fans and energy efficient lighting systems comprised of fluorescent lamps and electronic ballasts. Clean trash cans. Environmentally-friendly measures taken at Fenway Park include upgraded restrooms that reduce water use, solar powered trash compactors, recycling waste and using recycled materials for food service paper goods. Some of the large billboards at the ball park are illuminated with energy-efficient LED lighting systems. The team’s grounds crew uses biodiesel fuel in all mowers and uses electric utility carts that are exhaust and noise pollution free. In 2009, they began using a battery powered walk behind mower, an electric de-thatcher and battery powered small blower. They are also using more organic fertilizers and bio-stimulants on the grass.